Successful Facebook marketing is not primarily a matter of the amount of fans. More important is their activity. Likes, comments and shares are the fuel of virality and high rankings in news feeds. The Facebook Edge Rank is based on the interaction between fans and a Facebook Page. Interaction data delivers instructive information for fanpage operators. But what are good interaction rates? We have analyzed over 60.000 Facebook pages and 4.9. million post were analyzed during a 3-month-period. We will present different our results for different metrics during the coming weeks in this blog. Today we start with the Engagement Rate. 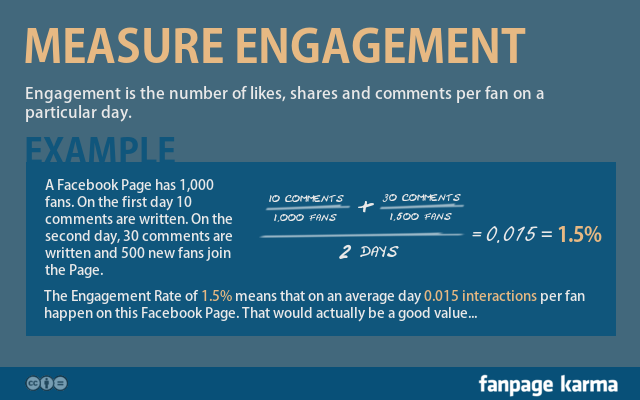 The engagement rate is the ratio of likes, comments and shares per day and fan during a certain period. It is a reliable indicator of the activity on a Facebook page. You can see an example of the calculation on the right. Unlike Facebook´s Talking About value, the calculation of engagement values can easily be understood. You can either do it manually or let us help you with our tool Fanpage Karma. The following analysis will help you assessing the engagement target value for your Facebook Page. The main findings of this study are summarized in an infographic at the end of this post. Most sites show very low engagement values. 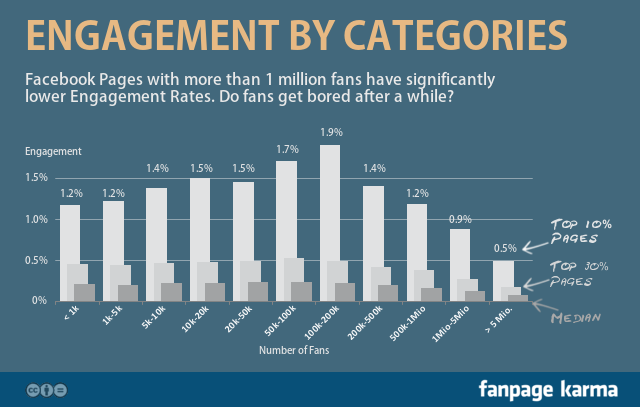 For half of them, the engagement value is below 0.2%, implying 0.002 interactions per fan and day. The top 10 sites show engagement values of 1.2% or higher. Higher values are primarily achieved by entertainment sites. The analysis clearly states a topic-related effect. 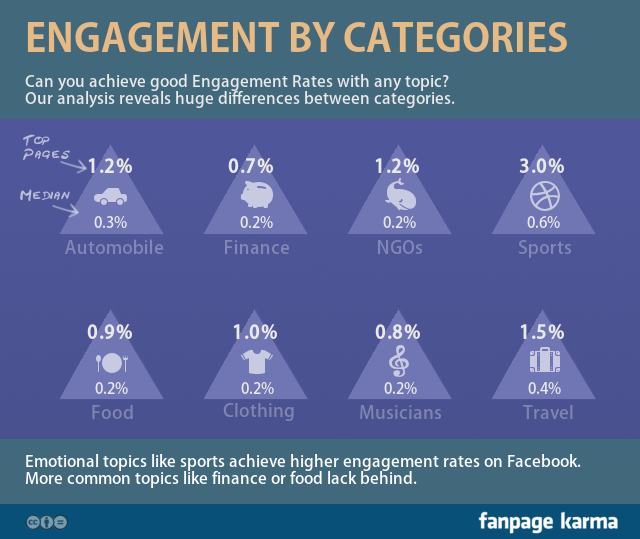 Top sport pages reach engagement levels above 3%, in finance just 0.7%. Topics such as food or clothing can not keep up with pages from categories as politics or travel. In general, emotional subjects deliver a higher impact. Size does matter – but why? Our study shows a clear connection between the size of a fan page and the engagement rate. Up to 200,000 fans the average engagement rates grow considerably. This could be due to the fact that bigger fan pages spend more time and money. But if the number of fans is higher than 1 million, engagement rates start to drop. This is not valid for all fan pages, as there are fan pages with a lot more than 1 million fans and high engagement rates. For example San Francisco 49ers, the Tea Party or Inked magazine. All three fan pages with controversial and/or emotional topics. But what is the reason that bigger fan pages on average have less interactions per fan? On the one hand, big fan pages are often run by well known brands. Someone may “like” a brand’s fan page, but this does not mean he is interested in it’s contents. The lack of interest may also grow over time. If you favored a start up in its early days, you may still like the company after some years but the tension is lost. So you stay fan but do not interact with the fan page anymore. This behavior can be seen for many pages: athletes, political parties, car brands etc. Another and probably the more important reason is that some big fan pages might buy their fans. They are not necessarily fake fans from India, but they could have been attracted with competitions. If such competitions are not well designed, a fan page may end up with a wrong fan community, which is not interested in a product but only looks for snips. They do not care for the content and messages of the fan page. How could you expect a high number of likes, shares and comments from such a fan base? We were surprised by national distinctions of engagement rates. In comparison to other countries, German speaking fan pages seam to perform better than fan pages from France, GB or the US. This is shown in the graph on the left hand side. 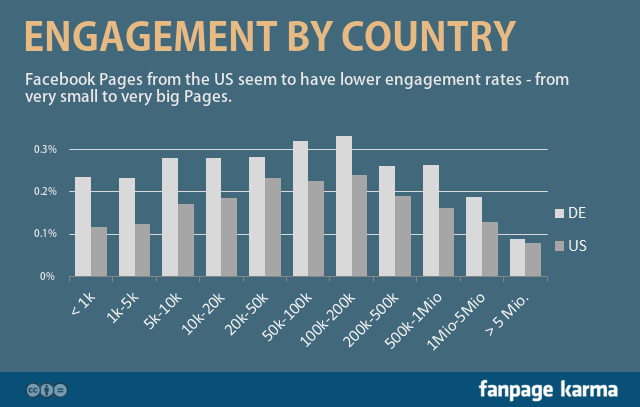 In all categories of size German fan pages perform better than those from the US. This might be due to the fact that social networks are more settled in the US and that a fan likes more fan pages in total or that disinterest on commercial contents developed during the years. If the US is a pioneer in this field, German speaking fan pages have to adapt to decreasing fan interactions. And react cleverly to that. Please notice: we will present more KPIs during the next weeks and analyse them. Have a look at our blog from time to time. Or become a Facebook fan and stay up to date. We summarized the results of this study in an infographic. You may share this infographic, but please refer to our blog.